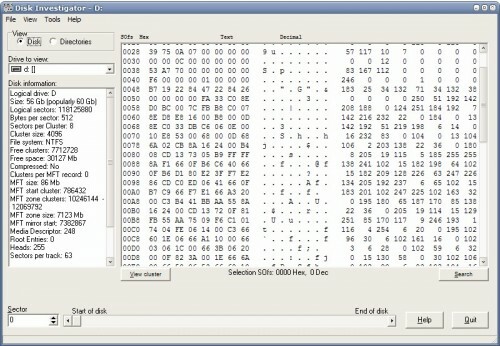 Disk Investigator is a pretty unique hard drive data retrieval tool that takes a totally different approach than the usual hard drive data recovery tools. What Disk Investigator does is to provide direct access to the raw data sectors of a selected hard drive so that the hard drive’s data can be explored up to the last bit. The user can perform a sector to sector analysis of the hard drive, display the raw file contents or perform a search on the selected hard drive or partition. So what will you find when your run a search or analyze the data on the hard drive? You will be able to discover opened urls, passwords, email contents, document contents and more. The easiest way to discover the data is by performing a search for it. You might be surprised at the wealth of information that can be discovered when running Disk Investigator. Another possible use for this software is to make sure that a disk wipe was successful. The software program works with most versions of the Windows operating system including Windows XP but with the exception of Windows Vista.